Ethiopians who live in urban areas, however, have a very different arrangement. Here the streets are walled, and behind the walls are compounds. Each compound is a section of land that contains a 2- or 3-roomed house for the land-owner and some individual rooms for a kitchen, a toilet, and a couple of rental rooms. Finally, in this compound is a small garden and perhaps a stall for a cow or a donkey. If it is luxurious, the compound will have an electric line and a faucet of water in the yard. Thievery abounds in most Ethiopian communities. In the rural areas, almost every home has a dog that stays outside at night. In the urban areas, the gate is locked, and sometimes a guard is hired for protection. God has placed us in the Alaba and Burji sections of Ethiopia. We work directly with the local "mother" church, assisting in the work of spreading the Gospel and strengthening believers. In addition to our help, the church has a number of "evangelists." In Burji, these are men who have left their homes in the rural areas to travel to distant places to plant churches. They leave their wives and children in the care of extended family, on the family farm, and they travel far and wide to spread the Gospel in places where there is no church. In Alaba, however, most of the evangelists have not left farms in the countryside; they have left urban businesses. The Alaba mother church sponsors a number of married-with-children evangelists. Almost all of these evangelists purchased their living compounds before they entered the evangelist work; their homes are secure and they have the opportunity for salary supplementation through rental of rooms in their compounds. However, there are two evangelists in Alaba that have suffered greatly in the 10 years that they have been doing the work of an evangelist. Ironically, both of these men are named Melesse. Melesse A. has 2 small children; Melesse O. has 7 children. They rent space in compounds belonging to other people. And on our recent trip, we saw more clearly the challenges this arrangement has been to them. There are 3 primary threats. 1) Communal Stress. As you can see, life within a compound is very close. Kitchen, yard, toilet, and security are shared with all the occupants. 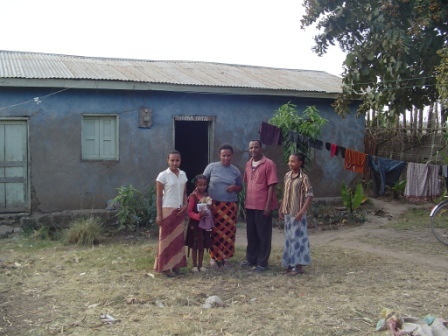 Since Alaba is 99 percent Muslim, these evangelist families are living side-by-side with people who often hate them. Also, Alaba has openly-practicing witch doctors who dwell in the compounds. Hence there is no rest, even at home, for the evangelist and his family. They are taunted day and night by those living within their compounds. Their children and wives are threatened because they are professing Christians. Spiritual stress is compounded as the Evil One blinds hearts to the Truth of the Savior and stirs up hatred. 2) Sudden Eviction. If the landlord is Muslim or Orthodox, he often will quickly evict the evangelist and his family for no other reason than his faith in the Lord Jesus. This form of persecution is seldom reported but it is real. Sometimes the notice is only one day! "Be gone by tonight," the landlord says. There are no rights for the renter and no legal rental protection like we have in this country. The threat of eviction is a constant one, yielding much insecurity. Even if the landlord is not strongly opposed to the evangelist, if the other occupants of the compound threaten him, then he will evict the evangelist in order to keep peace. 3) Rental Increases. Inflation in Ethiopia is a very real economic burden. The rate peaked in 2008 at 60 percent! They say that this year the rate is "only" 10%. (Compare that to the usual 2.5-3.00 percent here in the USA. Remember that the inflation rate is like the Richter scale for earthquakes; it is not a gradation of addition, but of multiplication.) The landlord must operate his compound with economic efficiency. This means increasing the rent frequently to keep up with inflation. Like eviction notices, rental notices are often given on short notice. And accommodating those increases within an evangelist salary is a challenge. The Alaba evangelist lives in the town, but he usually ministers in the rural areas. Most of his days are spent traveling back and forth. He leaves his family early in the morning and pushes himself physically and spiritually for the work. When Melesse A. and Melesse O. come home at night, they do not get rest. Rather, they get stress, threats, and spiritual warfare as they cope with the communal living conditions. Purchase of a small plot of land in Alaba Town...................................$1450. Building (with sticks and mud) an additional 2 rooms for rentals...........$1450. Total cost to help one evangelist family............... $5,050. The need is urgent. In the 5 years that we have been working in Alaba, we have watched these men suffer and age. Both men and their families have suffered great tribulation at the hands of Muslim and Orthodox. Both have suffered financial stress with low salaries and continuing rampant inflation. Both men are focused on the joys of serving the Lord. In our recent trip, Melesse A. had been sick for 7 months with malaria, typhoid, typhus, and gastritis. There is no doubt that part of the reason for delay in his recovery was due to his living condition. "Pray that I will preach the Gospel as expected. I have lots of needs for me and my family, but that is secondary. For 18 years I have been sharing the Gospel, telling unbelievers of Jesus. Let the people in America pray for me to share the Gospel as much as possible as God opens doors." Then he continued, "I have a message for believers in America. Those who do not give their life to the Lord will die without benefit for their neighbors. But those who give their life to the Lord will die with benefit for the whole world!" Do such men, serving so sacrificially with their families, "deserve" our help? We think so. $5,050 per family is very do-able for those of us blessed with wealth and security here in America. The Scriptures encourage us to share what we have, so that there might be equality (2 Cor. 8:13). Can we share $5,050 with these faithful servants?